Award-winning poet Amy Catanzano isn’t your average wordsmith. Where other poets dabble in heady descriptions of roiling oceans or soaring eagles, she coaxes the beauty out of quantum theory. 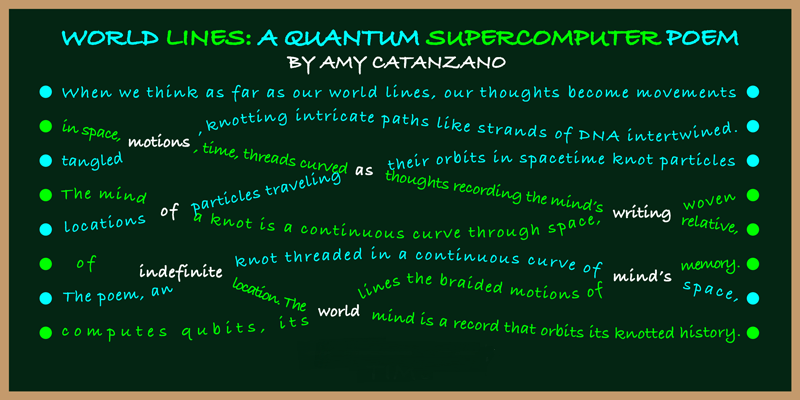 In her recent work, “World Lines: A Quantum Supercomputer Poem” she explores the wild and wacky world of quantum theory. Her poem works on both a literary and visual level, as it co-opts its appearance from a diagram representing a 4-qubit quantum computer’s basic function. The poem contains four poetic couplets that twist and intersect. Specific words lie at the center of more than one sentence, forcing the reader to choose which words to read next. Because of this, the poem can be read several different ways without losing its message. Think of it like Schrodinger’s poem: Until you read it, it’s several different poems at once. As reported by scientific journal Physics’ senior editor Katherine Wright, Catanzano wrote the poem over the course of a week-long residency at the Simons Center for Geometry and Physics at Stony Brook University, New York. You can read it, as it appears on Physics, by clicking here. When I created the poem at the Simons Center, I used the blackboard in my office there as a “circuit board” in which to “engineer” (create and write) this quantum supercomputer poem. I have also been thinking about how the poem can be seen as a “post-digital poem” in that it explores quantum computing rather than digital computing. We’re not sure if too many physicists will take Catanzano up on the offer, but those of us outside their realm of expertise can use all the help we can get. Understanding quantum physics can often be an exercise in the ridiculous for those of us who struggle to wrap our heads around ideas like entanglement and superposition. But, it’s easy to follow the lines of Catanzano’s poem and decide, for yourself, what happens when you come across a word that exists in two sentences at once. This is a great first step to figuring out what quantum computers do. In quantum computing a qubit – like a computer bit, but quantum – can exist in more than one state at a time. 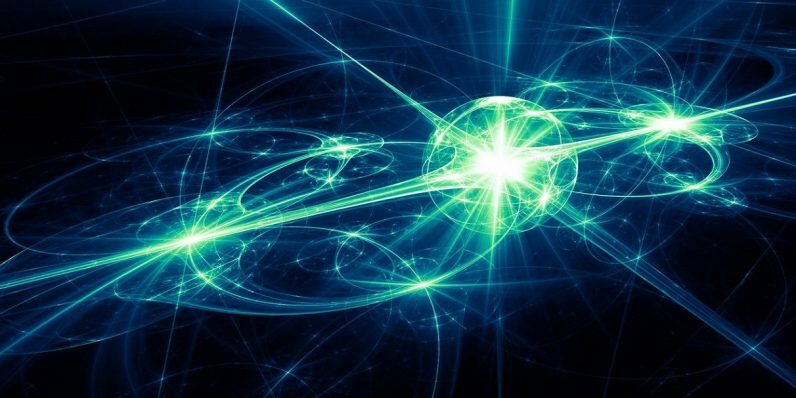 It’s only when a qubit is observed that the universe reveals the mystery of its position (and even then, scientists disagree on whether such a measurement is a ground-truth or not). Catanzano’s work invites the reader to make the ultimate decision. Is the word you’re reading part of one sentence, or another? Once you decide, as the universe does when a qubit is observed, the poem exists as you’ve chosen to read it. Perform another measurement, meaning read it again, and you have the opportunity to change the nature of the poem. Whether her work can create better dialogue between scientists and laypersons remains to be seen. But on its own merit, it certainly inspires a different perspective on quantum theory.